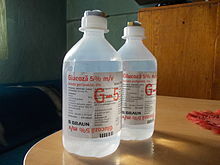 Glucose, as intravenous sugar solution, is on the World Health Organization's List of Essential Medicines, the most important medications needed in a basic health system. The name glucose derives through the French from the Greek γλυκός, which means "sweet," in reference to must, the sweet, first press of grapes in the making of wine. The suffix "-ose" is a chemical classifier, denoting a sugar. Glucose was first isolated from raisins in 1747 by the German chemist Andreas Marggraf. Glucose was discovered in grapes by Johann Tobias Lowitz in 1792 and recognized as different from cane sugar (sucrose). Glucose is the term coined by Jean Baptiste Dumas in 1838, which has prevailed in the chemical literature. Friedrich August Kekulé proposed the term dextrose (from Latin dexter = right), because in aqueous solution of glucose, the plane of linearly polarized light is turned to the right. In contrast, D-fructose (a ketohexose) and L/-glucose turn linearly polarized light to the left. The earlier notation according to the rotation of the plane of linearly polarized light (d and l-nomenclature) was later abandoned in favor of the D- and L-notation, which refers to the absolute configuration of the asymmetric center farthest from the carbonyl group, and in concordance with the configuration of D- or L-glyceraldehyde. Since glucose is a basic necessity of many organisms, a correct understanding of its chemical makeup and structure contributed greatly to a general advancement in organic chemistry. This understanding occurred largely as a result of the investigations of Emil Fischer, a German chemist who received the 1902 Nobel Prize in Chemistry for his findings. The synthesis of glucose established the structure of organic material and consequently formed the first definitive validation of Jacobus Henricus van 't Hoff's theories of chemical kinetics and the arrangements of chemical bonds in carbon-bearing molecules. Between 1891 and 1894, Fischer established the stereochemical configuration of all the known sugars and correctly predicted the possible isomers, applying van 't Hoff's theory of asymmetrical carbon atoms. The names initially referred to the natural substances. Their enantiomers were given the same name with the introduction of systematic nomenclatures, taking into account absolute stereochemistry (e.g. Fischer nomenclature, D/L nomenclature). For the discovery of the metabolism of glucose Otto Meyerhof received the Nobel Prize in Physiology or Medicine in 1922. Hans von Euler-Chelpin was awarded the Nobel Prize in Chemistry along with Arthur Harden in 1929 for their "research on the fermentation of sugar and their share of enzymes in this process". In 1947, Bernardo Houssay (for his discovery of the role of the pituitary gland in the metabolism of glucose and the derived carbohydrates) as well as Carl and Gerty Cori (for their discovery of the conversion of glycogen from glucose) received the Nobel Prize in Physiology or Medicine. In 1970, Luis Leloir was awarded the Nobel Prize in Chemistry for the discovery of glucose-derived sugar nucleotides in the biosynthesis of carbohydrates. With six carbon atoms, it is classed as a hexose, a subcategory of the monosaccharides. D-Glucose is one of the sixteen aldohexose stereoisomers. The D-isomer, D-glucose, also known as dextrose, occurs widely in nature, but the L-isomer, L-glucose, does not. Glucose can be obtained by hydrolysis of carbohydrates such as milk sugar (lactose), cane sugar (sucrose), maltose, cellulose, glycogen, etc. It is commonly commercially manufactured from cornstarch by hydrolysis via pressurized steaming at controlled pH in a jet followed by further enzymatic depolymerization. Unbonded glucose is one of the main ingredients of honey. All forms of glucose are colorless and easily soluble in water, acetic acid, and several other solvents. They are only sparingly soluble in methanol and ethanol. Glucose is a monosaccharide with formula C6H12O6 or H-(C=O)-(CHOH)5-H, whose five hydroxyl (OH) groups are arranged in a specific way along its six-carbon back. Glucose is usually present in solid form as a monohydrate with a closed pyran ring (dextrose hydrate). In aqueous solution, on the other hand, it is an open-chain to a small extent and is present predominantly as α- or β-pyranose, which partially mutually merge by mutarotation. From aqueous solutions, the three known forms can be crystallized: α-glucopyranose, β-glucopyranose and β-glucopyranose hydrate. 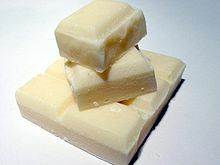 Glucose is a building block of the disaccharides lactose and sucrose (cane or beet sugar), of oligosaccharides such as raffinose and of polysaccharides such as starch and amylopectin, glycogen or cellulose. The glass transition temperature of glucose is 31 °C and the Gordon-Taylor constant (an experimentally determined constant for the prediction of the glass transition temperature for different mass fractions of a mixture of two substances) is 4.5. In its fleeting open-chain form, the glucose molecule has an open (as opposed to cyclic) and unbranched backbone of six carbon atoms, C-1 through C-6; where C-1 is part of an aldehyde group H(C=O)-, and each of the other five carbons bears one hydroxyl group -OH. The remaining bonds of the backbone carbons are satisfied by hydrogen atoms -H. Therefore, glucose is both a hexose and an aldose, or an aldohexose. The aldehyde group makes glucose a reducing sugar giving a positive reaction with the Fehling test. Each of the four carbons C-2 through C-5 is a stereocenter, meaning that its four bonds connect to four different substituents. (Carbon C-2, for example, connects to -(C=O)H, -OH, -H, and -(CHOH)4H.) In D-glucose, these four parts must be in a specific three-dimensional arrangement. Namely, when the molecule is drawn in the Fischer projection, the hydroxyls on C-2, C-4, and C-5 must be on the right side, while that on C-3 must be on the left side. The positions of those four hydroxyls are exactly reversed in the Fischer diagram of L-glucose. D- and L-glucose are two of the 16 possible aldohexoses; the other 14 are allose, altrose, galactose, gulose, idose, mannose, and talose, each with two enantiomers, “D-” and “L-”. It is important to note that the linear form of glucose makes up less than 0.02% of the glucose molecules in a water solution. The rest is one of two cyclic forms of glucose that are formed when the hydroxyl group on carbon 5 (C5) bonds to the aldehyde carbon 1 (C1). In solutions, the open-chain form of glucose (either "D-" or "L-") exists in equilibrium with several cyclic isomers, each containing a ring of carbons closed by one oxygen atom. In aqueous solution however, more than 99% of glucose molecules, at any given time, exist as pyranose forms. The open-chain form is limited to about 0.25% and furanose forms exists in negligible amounts. The terms "glucose" and "D-glucose" are generally used for these cyclic forms as well. The ring arises from the open-chain form by an intramolecular nucleophilic addition reaction between the aldehyde group (at C-1) and either the C-4 or C-5 hydroxyl group, forming a hemiacetal linkage, -C(OH)H-O-. The reaction between C-1 and C-5 yields a six-membered heterocyclic system called a pyranose, which is a monosaccharide sugar (hence "–ose") containing a derivatised pyran skeleton. The (much rarer) reaction between C-1 and C-4 yields a five-membered furanose ring, named after the cyclic ether furan. In either case, each carbon in the ring has one hydrogen and one hydroxyl attached, except for the last carbon (C-4 or C-5) where the hydroxyl is replaced by the remainder of the open molecule (which is -(C(CH2OH)HOH)-H or -(CHOH)-H, respectively). The ring-closing reaction makes carbon C-1 chiral, too, since its four bonds lead to -H, to -OH, to carbon C-2, and to the ring oxygen. These four parts of the molecule may be arranged around C-1 (the anomeric carbon) in two distinct ways, designated by the prefixes "α-" and "β-". When a glucopyranose molecule is drawn in the Haworth projection, the designation "α-" means that the hydroxyl group attached to C-1 and the -CH2OH group at C-5 lies on opposite sides of the ring's plane (a trans arrangement), while "β-" means that they are on the same side of the plane (a cis arrangement). Therefore, the open-chain isomer D-glucose gives rise to four distinct cyclic isomers: α-D-glucopyranose, β-D-glucopyranose, α-D-glucofuranose, and β-D-glucofuranose. These five structures exist in equilibrium and interconvert, and the interconversion is much more rapid with acid catalysis. In the solid state, only the glucopyranose forms are observed, forming colorless crystalline solids that are highly soluble in water and acetic acid but poorly soluble in methanol and ethanol. They melt at 146 °C (295 °F) (α) and 150 °C (302 °F) (β), and decompose at higher temperatures into carbon and water. Each glucose isomer is subject to rotational isomerism. Within the cyclic form of glucose, rotation may occur around the O6-C6-C5-O5 torsion angle, termed the ω-angle, to form three staggered rotamer conformations called gauche-gauche (gg), gauche-trans (gt) and trans-gauche (tg). There is a tendency for the ω-angle to adopt a gauche conformation, a tendency that is attributed to the gauche effect. Mutarotation: D-glucose molecules exist as cyclic hemiacetals that are epimeric (= diastereomeric) to each other. The epimeric ratio α:β is 36:64. In the α-D-glucopyranose (left), the blue-labeled hydroxy group is in the axial position at the anomeric center, whereas in the β-D-glucopyranose (right) the blue-labeled hydroxy group is in equatorial position at the anomeric center. Mutarotation consists of a temporary reversal of the ring-forming reaction, resulting in the open-chain form, followed by a reforming of the ring. The ring closure step may use a different -OH group than the one recreated by the opening step (thus switching between pyranose and furanose forms), or the new hemiacetal group created on C-1 may have the same or opposite handedness as the original one (thus switching between the α and β forms). Thus, though the open-chain form is barely detectable in solution, it is an essential component of the equilibrium. The open-chain form is thermodynamically unstable, and it spontaneously isomerizes to the cyclic forms. (Although the ring closure reaction could in theory create four- or three-atom rings, these would be highly strained, and are not observed in practice.) In solutions at room temperature, the four cyclic isomers interconvert over a time scale of hours, in a process called mutarotation. Starting from any proportions, the mixture converges to a stable ratio of α:β 36:64. The ratio would be α:β 11:89 if it were not for the influence of the anomeric effect. Mutarotation is considerably slower at temperatures close to 0 °C (32 °F). Whether in water or in the solid form, D-(+)-glucose is dextrorotatory, meaning it will rotate the direction of polarized light clockwise as seen looking toward the light source. The effect is due to the chirality of the molecules, and indeed the mirror-image isomer, L-(−)-glucose, is levorotatory (rotates polarized light counterclockwise) by the same amount. The strength of the effect is different for each of the five tautomers. Note that the D- prefix does not refer directly to the optical properties of the compound. It indicates that the C-5 chiral center has the same handedness as that of D-glyceraldehyde (which was so labeled because it is dextrorotatory). The fact that D-glucose is dextrorotatory is a combined effect of its four chiral centers, not just of C-5; and indeed some of the other D-aldohexoses are levorotatory. The conversion between the two anomers can be observed in a polarimeter, since pure α-D-glucose has a specific rotation angle of +112.2 ° · ml · dm−1 · g−1, pure β- D- glucose of +17.5 ° · ml · dm−1 · g−1. When equilibrium has been reached after a certain time due to mutarotation, the angle of rotation is +52.7 ° · ml · dm−1 · g−1. By adding acid or base, this transformation is much accelerated. The equilibration takes place via the open-chain aldehyde form. Glucose is the most abundant monosaccharide. Glucose is also the most widely used aldohexose in most living organisms. One possible explanation for this is that glucose has a lower tendency than other aldohexoses to react nonspecifically with the amine groups of proteins. This reaction—glycation—impairs or destroys the function of many proteins, e.g. in glycated hemoglobin. Glucose's low rate of glycation can be attributed to its having a more stable cyclic form compared to other aldohexoses, which means it spends less time than they do in its reactive open-chain form. The reason for glucose having the most stable cyclic form of all the aldohexoses is that its hydroxy groups (with the exception of the hydroxy group on the anomeric carbon of D-glucose) are in the equatorial position. Presumably, glucose is the most abundant natural monosaccharide because it is less glycated with proteins than other monosaccharides. Another hypothesis is that glucose, being the only D-aldohexose that has all five hydroxy substituents in the equatorial position in the form of β-D-glucose, is more readily accessible to chemical reactions, for example, for esterification or acetal formation. For this reason, D-glucose is also a highly preferred building block in natural polysaccharides (glycans). Polysaccharides that are composed solely of Glucose are termed glucans. Glucose is produced by plants through the photosynthesis using sunlight, water and carbon dioxide and can be used by all living organisms as an energy and carbon source. However, most glucose does not occur in its free form, but in the form of its polymers, i.e. lactose, sucrose, starch and others which are energy reserve substances, and cellulose and chitin, which are components of the cell wall in plants or fungi and arthropods, respectively. These polymers are degraded to glucose during food intake by animals, fungi and bacteria using enzymes. All animals are also able to produce glucose themselves from certain precursors as the need arises. Nerve cells, cells of the renal medulla and erythrocytes depend on glucose for their energy production. In adult humans, there are about 18 g of glucose, of which about 4 g are present in the blood. Approximately 180 to 220 g of glucose are produced in the liver of an adult in 24 hours. Many of the long-term complications of diabetes (e.g., blindness, kidney failure, and peripheral neuropathy) are probably due to the glycation of proteins or lipids. In contrast, enzyme-regulated addition of sugars to protein is called glycosylation and is essential for the function of many proteins. Ingested glucose initially binds to the receptor for sweet taste on the tongue in humans. This complex of the proteins T1R2 and T1R3 makes it possible to identify glucose-containing food sources. Glucose mainly comes from food - about 300 g per day are produced by conversion of food, but it is also synthesized from other metabolites in the body's cells. In humans, the breakdown of glucose-containing polysaccharides happens in part already during chewing by means of amylase, which is contained in saliva, as well as by maltase, lactase and sucrase on the brush border of the small intestine. Glucose is a building block of many carbohydrates and can be split off from them using certain enzymes. Glucosidases, a subgroup of the glycosidases, first catalyze the hydrolysis of long-chain glucose-containing polysaccharides, removing terminal glucose. In turn, disaccharides are mostly degraded by specific glycosidases to glucose. The names of the degrading enzymes are often derived from the particular poly- and disaccharide; inter alia, for the degradation of polysaccharide chains there are amylases (named after amylose, a component of starch), cellulases (named after cellulose), chitinases (named after chitin) and more. Furthermore, for the cleavage of disaccharides, there are maltase, lactase, sucrase, trehalase and others. In humans, about 70 genes are known that code for glycosidases. They have functions in the digestion and degradation of glycogen, sphingolipids, mucopolysaccharides and poly(ADP-ribose). Humans do not produce cellulases, chitinases and trehalases, but the bacteria in the gut flora do. In order to get into or out of cell membranes of cells and membranes of cell compartments, glucose requires special transport proteins from the major facilitator superfamily. In the small intestine (more precisely, in the jejunum), glucose is taken up into the intestinal epithelial cells with the help of glucose transporters via a secondary active transport mechanism called sodium ion-glucose symport via the sodium/glucose cotransporter 1. The further transfer occurs on the basolateral side of the intestinal epithelial cells via the glucose transporter GLUT2, as well as their uptake into liver cells, kidney cells, cells of the islets of Langerhans, nerve cells, astrocytes and tanyocytes. Glucose enters the liver via the vena portae and is stored there as a cellular glycogen. In the liver cell, it is phosphorylated by glucokinase at position 6 to glucose-6-phosphate, which can not leave the cell. With the help of glucose-6-phosphatase, glucose-6-phosphate is converted back into glucose exclusively in the liver, if necessary, so that it is available for maintaining a sufficient blood glucose concentration. In other cells, uptake happens by passive transport through one of the 14 GLUT proteins. In the other cell types, phosphorylation occurs through a hexokinase, whereupon glucose can no longer diffuse out of the cell. The glucose transporter GLUT1 is produced by most cell types and is of particular importance for nerve cells and pancreatic β-cells. GLUT3 is highly expressed in nerve cells. Glucose from the bloodstream is taken up by GLUT4 from muscle cells (of the skeletal muscle and heart muscle) and fat cells. GLUT14 is formed exclusively in testes. Excess glucose is broken down and converted into fatty acids, which are stored as triacylglycerides. In the kidneys, glucose in the urine is absorbed via SGLT1 and SGLT2 in the apical cell membranes and transmitted via GLUT2 in the basolateral cell membranes. About 90% of kidney glucose reabsorption is via SGLT2 and about 3% via SGLT1. In plants and some prokaryotes, glucose is a product of photosynthesis. Glucose is also formed by the breakdown of polymeric forms of glucose like glycogen (in animals and mushrooms) or starch (in plants). The cleavage of glycogen is termed glycogenolysis, the cleavage of starch is called starch degradation. The metabolic pathway that begins with molecules containing two to four carbon atoms (C) and ends in the glucose molecule containing six carbon atoms is called gluconeogenesis and occurs in all living organisms. The smaller starting materials are the result of other metabolic pathways. Ultimately almost all biomolecules come from the assimilation of carbon dioxide in plants during photosynthesis. The free energy of formation of α-D-glucose is 917.2 kilojoules per mole. In humans, gluconeogenesis occurs in the liver and kidney, but also in other cell types. In the liver about 150 g of glycogen are stored, in skeletal muscle about 250 g. However, the glucose released in muscle cells upon cleavage of the glycogen can not be delivered to the circulation because glucose is phosphorylated by the hexokinase, and a glucose-6-phosphatase is not expressed to remove the phosphate group. Unlike for glucose, there is no transport protein for glucose-6-phosphate. Gluconeogenesis allows the organism to build up glucose from other metabolites, including lactate or certain amino acids, while consuming energy. The renal tubular cells can also produce glucose. Glucose is stored in mainly the liver and muscles as glycogen. It is distributed and used in tissues as free glucose. In humans, glucose is metabolised by glycolysis and the pentose phosphate pathway. Glycolysis is used by all living organisms, with small variations, and all organisms generate energy from the breakdown of monosaccharides. In the further course of the metabolism, it can be completely degraded via oxidative decarboxylation, the Krebs cycle (synonym citric acid cycle) and the respiratory chain to water and carbon dioxide. If there is not enough oxygen available for this, the glucose degradation in animals occurs anaerobic to lactate via lactic acid fermentation and releases less energy. Muscular lactate enters the liver through the bloodstream in mammals, where gluconeogenesis occurs (Cori cycle). With a high supply of glucose, the metabolite acetyl-CoA from the Krebs cycle can also be used for fatty acid synthesis. Glucose is also used to replenish the body's glycogen stores, which are mainly found in liver and skeletal muscle. These processes are hormonally regulated. In other living organisms, other forms of fermentation can occur. The bacterium Escherichia coli can grow on nutrient media containing glucose as the sole carbon source. In some bacteria and, in modified form, also in archaea, glucose is degraded via the Entner-Doudoroff pathway. Use of glucose as an energy source in cells is by either aerobic respiration, anaerobic respiration, or fermentation. The first step of glycolysis is the phosphorylation of glucose by a hexokinase to form glucose 6-phosphate. The main reason for the immediate phosphorylation of glucose is to prevent its diffusion out of the cell as the charged phosphate group prevents glucose 6-phosphate from easily crossing the cell membrane. Furthermore, addition of the high-energy phosphate group activates glucose for subsequent breakdown in later steps of glycolysis. At physiological conditions, this initial reaction is irreversible. In anaerobic respiration, one glucose molecule produces a net gain of two ATP molecules (four ATP molecules are produced during glycolysis through substrate-level phosphorylation, but two are required by enzymes used during the process). In aerobic respiration, a molecule of glucose is much more profitable in that a maximum net production of 30 or 32 ATP molecules (depending on the organism) through oxidative phosphorylation is generated. Tumor cells often grow comparatively quickly and consume an above-average amount of glucose by glycolysis, which leads to the formation of lactate, the end product of fermentation in mammals, even in the presence of oxygen. This effect is called the Warburg effect. For the increased uptake of glucose in tumors various SGLT and GLUT are overly produced. In yeast, ethanol is fermented at high glucose concentrations, even in the presence of oxygen (which normally leads to respiration but not to fermentation). This effect is called the Crabtree effect. Glucose is a ubiquitous fuel in biology. It is used as an energy source in organisms, from bacteria to humans, through either aerobic respiration, anaerobic respiration (in bacteria), or fermentation. Glucose is the human body's key source of energy, through aerobic respiration, providing about 3.75 kilocalories (16 kilojoules) of food energy per gram. Breakdown of carbohydrates (e.g., starch) yields mono- and disaccharides, most of which is glucose. Through glycolysis and later in the reactions of the citric acid cycle and oxidative phosphorylation, glucose is oxidized to eventually form carbon dioxide and water, yielding energy mostly in the form of ATP. The insulin reaction, and other mechanisms, regulate the concentration of glucose in the blood. The physiological caloric value of glucose, depending on the source, is 16.2 kilojoules per gram and 15.7 kJ/g (3.74 kcal/g), respectively. The high availability of carbohydrates from plant biomass has led to a variety of methods during evolution, especially in microorganisms, to utilize the energy and carbon storage glucose. Differences exist in which end product can no longer be used for energy production. The presence of individual genes, and their gene products, the enzymes, determine which reactions are possible. 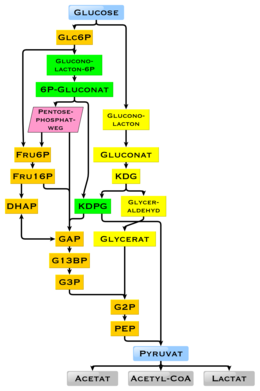 The metabolic pathway of glycolysis is used by almost all living beings. An essential difference in the use of glycolysis is the recovery of NADPH as a reductant for anabolism that would otherwise have to be generated indirectly. Glucose supplies almost all the energy for the brain, so its availability influences psychological processes. When glucose is low, psychological processes requiring mental effort (e.g., self-control, effortful decision-making) are impaired. In the brain, which is dependent on glucose as the major source of energy, the glucose concentration is usually 4 to 6 mM (5 mM equals 90 mg / dL), but decreases to 2 to 3 mM when fasting. Confusion occurs below 1 mM and coma at lower levels. The glucose in the blood is called blood sugar. Blood sugar levels are regulated by glucose-binding nerve cells in the hypothalamus. In addition, glucose in the brain binds to glucose receptors of the reward system in the nucleus accumbens. The binding of glucose to the sweet receptor on the tongue induces a release of various hormones of energy metabolism, either through glucose or through other sugars, leading to an increased cellular uptake and lower blood sugar levels. Artificial sweeteners do not lower blood sugar levels. The blood sugar content of a healthy person in the short-time fasting state, e.g. after overnight fasting, is about 70 to 100 mg/dl of blood (4 to 5.5 mM). In blood plasma, the measured values are about 10-15 % higher. In addition, the values in the arterial blood are higher than the concentrations in the venous blood since glucose is absorbed into the tissue during the passage of the capillary bed. Also in the capillary blood, which is often used for blood sugar determination, the values are sometimes higher than in the venous blood. The glucose content of the blood is regulated by the hormones insulin, incretin and glucagon. Insulin lowers the glucose level, glucagon increases it. Furthermore, the hormones adrenaline, thyroxine, glucocorticoids, somatotropin and adrenocorticotropin lead to an increase in the glucose level. In addition, there is also a hormone-independent regulation, which is referred to as glucose autoregulation. After food intake the blood sugar concentration increases. Values over 180 mg/dl in venous whole blood are pathological and are termed hyperglycemia, values below 40 mg/dl are termed hypoglycaemia. When needed, glucose is released into the bloodstream by glucose-6-phosphatase from glucose-6-phosphate originating from liver and kidney glycogen, thereby regulating the homeostasis of blood glucose concentration. In ruminants, the blood glucose concentration is lower (60 mg/dL in cattle and 40 mg/dL in sheep), because the carbohydrates are converted more by their gut flora into short-chain fatty acids. Some glucose is converted to lactic acid by astrocytes, which is then utilized as an energy source by brain cells; some glucose is used by intestinal cells and red blood cells, while the rest reaches the liver, adipose tissue and muscle cells, where it is absorbed and stored as glycogen (under the influence of insulin). Liver cell glycogen can be converted to glucose and returned to the blood when insulin is low or absent; muscle cell glycogen is not returned to the blood because of a lack of enzymes. In fat cells, glucose is used to power reactions that synthesize some fat types and have other purposes. Glycogen is the body's "glucose energy storage" mechanism, because it is much more "space efficient" and less reactive than glucose itself. As a result of its importance in human health, glucose is an analyte in glucose tests that are common medical blood tests. Eating or fasting prior to taking a blood sample has an effect on analyses for glucose in the blood; a high fasting glucose blood sugar level may be a sign of prediabetes or diabetes mellitus. The glycemic index is an indicator of the speed of resorption and conversion to blood glucose levels from ingested carbohydrates, measured as the area under the curve of blood glucose levels after consumption in comparison to glucose (glucose is defined as 100). The clinical importance of the glycemic index is controversial, as foods with high fat contents slow the resorption of carbohydrates and lower the glycemic index, e.g. ice cream. An alternative indicator is the insulin index, measured as the impact of carbohydrate consumption on the blood insulin levels. The glycemic load is an indicator for the amount of glucose added to blood glucose levels after consumption, based on the glycemic index and the amount of consumed food. Organisms use glucose as a precursor for the synthesis of several important substances. Starch, cellulose, and glycogen ("animal starch") are common glucose polymers (polysaccharides). Some of these polymers (starch or glycogen) serve as energy stores, while others (cellulose and chitin, which is made from a derivative of glucose) have structural roles. Oligosaccharides of glucose combined with other sugars serve as important energy stores. These include lactose, the predominant sugar in milk, which is a glucose-galactose disaccharide, and sucrose, another disaccharide which is composed of glucose and fructose. Glucose is also added onto certain proteins and lipids in a process called glycosylation. This is often critical for their functioning. The enzymes that join glucose to other molecules usually use phosphorylated glucose to power the formation of the new bond by coupling it with the breaking of the glucose-phosphate bond. Other than its direct use as a monomer, glucose can be broken down to synthesize a wide variety of other biomolecules. This is important, as glucose serves both as a primary store of energy and as a source of organic carbon. Glucose can be broken down and converted into lipids. It is also a precursor for the synthesis of other important molecules such as vitamin C (ascorbic acid). In living organisms, glucose is converted to several other chemical compounds that are the starting material for various metabolic pathways. Among them, all other monosaccharides such as fructose (via the polyol pathway), mannose (the epimer of glucose at position 2), galactose (the epimer at position 4), fucose, various uronic acids and the amino sugars are produced from glucose. In addition to the phosphorylation to glucose-6-phosphate, which is part of the glycolysis, glucose can be oxidized during its degradation to glucono-1,5-lactone. Glucose is used in some bacteria as a building block in the trehalose or the dextran biosynthesis and in animals as a building block of glycogen. Glucose can also be converted from bacterial xylose isomerase to fructose. In addition, glucose metabolites produce all nonessential amino acids, sugar alcohols such as mannitol and sorbitol, fatty acids, cholesterol and nucleic acids. Finally, glucose is used as a building block in the glycosylation of proteins to glycoproteins, glycolipids, peptidoglycans, glycosides and other substances (catalyzed by glycosyltransferases) and can be cleaved from them by glycosidases. Diabetes is a metabolic disorder where the body is unable to regulate levels of glucose in the blood either because of a lack of insulin in the body or the failure, by cells in the body, to respond properly to insulin. Each of these situations can be caused by persistently high elevations of blood glucose levels, through pancreatic burnout and insulin resistance. The pancreas is the organ responsible for the secretion of the hormones insulin and glucagon. Insulin is a hormone that regulates glucose levels, allowing the body's cells to absorb and use glucose. Without it, glucose cannot enter the cell and therefore cannot be used as fuel for the body's functions. If the pancreas is exposed to persistently high elevations of blood glucose levels, the insulin-producing cells in the pancreas could be damaged, causing a lack of insulin in the body. Insulin resistance occurs when the pancreas tries to produce more and more insulin in response to persistently elevated blood glucose levels. Eventually, the rest of the body becomes resistant to the insulin that the pancreas is producing, thereby requiring more insulin to achieve the same blood glucose-lowering effect, and forcing the pancreas to produce even more insulin to compete with the resistance. This negative spiral contributes to pancreatic burnout, and the disease progression of diabetes. To monitor the body's response to blood glucose-lowering therapy, glucose levels can be measured. Blood glucose monitoring can be performed by multiple methods, such as the fasting glucose test which measures the level of glucose in the blood after 8 hours of fasting. Another test is the 2-hour glucose tolerance test (GTT) – for this test, the person has a fasting glucose test done, then drinks a 75-gram glucose drink and is retested. This test measures the ability of the person's body to process glucose. Over time the blood glucose levels should decrease as insulin allows it to be taken up by cells and exit the blood stream. An increased intake of glucose leads to obesity and, in consequence, partly to the metabolic syndrome with non-alcoholic fatty liver disease, but not the consumption of glucose as part of a normal calorie intake. Individuals with diabetes or other conditions that result in low blood sugar often carry small amounts of sugar in various forms. One sugar commonly used is glucose, often in the form of glucose tablets (glucose pressed into a tablet shape sometimes with one or more other ingredients as a binder), hard candy, or sugar packet. Most dietary carbohydrates contain glucose, either as their only building block (as in the polysaccharides starch and glycogen), or together with another monosaccharide (as in the hetero-polysaccharides sucrose and lactose). Unbounded glucose is one of the main ingredients of honey. ^A The carbohydrate figure is calculated in the USDA database and does not always correspond to the sum of the sugars, the starch, and the "dietary fiber". All data with a unit of g (gram) are based on 100 g of a food item. Glucose is produced industrially from starch by enzymatic hydrolysis using glucose amylase or by the use of acids. The enzymatic hydrolysis has largely displaced the acid-catalyzed hydrolysis. The result is glucose syrup (enzymatically with more than 90% glucose in the dry matter) with an annual worldwide production volume of 20 million tonnes (as of 2011). This is the reason for the former common name "starch sugar". The amylases most often come from Bacillus licheniformis or Bacillus subtilis (strain MN-385), which are more thermostable than the originally used enzymes. Starting in 1982, pullulanases from Aspergillus niger were used in the production of glucose syrup to convert amylopectin to starch (amylose), thereby increasing the yield of glucose. The reaction is carried out at a pH of 4.6-5.2 and a temperature of 55-60 °C. Corn syrup has between 20% and 95% glucose in the dry matter. The Japanese form of the glucose syrup, Mizuame, is made from sweet potato or rice starch. Maltodextrin contains about 20% glucose. Many crops can be used as the source of starch. Maize, rice, wheat, cassava, potato, barley, sweet potato, corn husk and sago are all used in various parts of the world. In the United States, corn starch (from maize) is used almost exclusively. Some commercial glucose occurs as a component of invert sugar, a roughly 1:1 mixture of glucose and fructose that is produced from sucrose. In principle, cellulose could be hydrolysed to glucose, but this process is not yet commercially practical. In the USA almost exclusively corn (more precisely: corn syrup) is used as glucose source for the production of isoglucose, which is a mixture of glucose and fructose, since fructose has a higher sweetening power — with same physiological calorific value of 374 kilocalories per 100 g. The annual world production of isoglucose is eight million tonnes (as of 2011). When made from corn syrup, the final product is high fructose corn syrup (HFCS). Glucose is mainly used for the production of fructose and in the production of glucose-containing foods. In foods, it is used as a sweetener, humectant, to increase the volume and to create a softer mouthfeel. Various sources of glucose, such as grape juice (for wine) or malt (for beer), are used for fermentation to ethanol during the production of alcoholic beverages. Most soft drinks in the US use HFCS-55 (with a fructose content of 55% in the dry mass), while most other HFCS-sweetened foods in the US use HFCS-42 (with a fructose content of 42% in the dry mass). In the neighboring country Mexico, on the other hand, cane sugar is used in the soft drink as a sweetener, which has a higher sweetening power. In addition, glucose syrup is used, inter alia, in the production of confectionery such as candies, toffee and fondant. Typical chemical reactions of glucose when heated under water-free conditions are the caramelization and, in presence of amino acids, the maillard reaction. In addition, various organic acids can be biotechnologically produced from glucose, for example by fermentation with Clostridium thermoaceticum to produce acetic acid, with Penicilium notatum for the production of araboascorbic acid, with Rhizopus delemar for the production of fumaric acid, with Aspergillus niger for the production of gluconic acid, with Candida brumptii to produce isocitric acid, with Aspergillus terreus for the production of itaconic acid, with Pseudomonas fluorescens for the production of 2-ketogluconic acid, with Gluconobacter suboxydans for the production of 5-ketogluconic acid, with Aspergillus oryzae for the production of kojic acid, with Lactobacillus delbrueckii for the production of lactic acid, with Lactobacillus brevis for the production of malic acid, with Propionibacter shermanii for the production of propionic acid, with Pseudomonas aeruginosa for the production of pyruvic acid and with Gluconobacter suboxydans for the production of tartaric acid. Specifically, when a glucose molecule is to be detected at a certain position in a larger molecule, nuclear magnetic resonance spectroscopy, X-ray crystallography analysis or lectin immunostaining is performed with concanavalin A reporter enzyme conjugate (that binds only glucose or mannose). The Fehling test is a classic method for the detection of aldoses. Due to mutarotation, glucose is always present to a small extent as an open-chain aldehyde. By adding the Fehling reagents (Fehling (I) solution and Fehling (II) solution), the aldehyde group is oxidized to a carboxylic acid, while the Cu2+ tartrate complex is reduced to Cu+ and forming a brick red precipitate (Cu2O). In the Tollens test, after addition of ammoniacal AgNO3 to the sample solution, Ag+ is reduced by glucose to elemental silver. In Barfoed's test, a solution of dissolved copper acetate, sodium acetate and acetic acid is added to the solution of the sugar to be tested and subsequently heated in a water bath for a few minutes. Glucose and other monosaccharides rapidly produce a reddish color and reddish brown copper(I) oxide (Cu2O). As a reducing sugar, glucose reacts in the Nylander's test. Upon heating a dilute potassium hydroxide solution with glucose to 100 °C, a strong reddish browning and a caramel-like odor develops. Concentrated sulfuric acid dissolves dry glucose without blackening at room temperature forming sugar sulfuric acid. In a yeast solution, alcoholic fermentation produces carbon dioxide in the ratio of 2.0454 molecules of glucose to one molecule of CO2. Glucose forms a black mass with stannous chloride. In an ammoniacal silver solution, glucose (as well as lactose and dextrin) leads to the deposition of silver. In an ammoniacal lead acetate solution, white lead glycoside is formed in the presence of glucose, which becomes less soluble on cooking and turns brown. In an ammoniacal copper solution, yellow copper oxide hydrate is formed with glucose at room temperature, while red copper oxide is formed during boiling (same with dextrin, except for with an ammoniacal copper acetate solution). With Hager's reagent, glucose forms mercury oxide during boiling. An alkaline bismuth solution is used to precipitate elemental, black-brown bismuth with glucose. Glucose boiled in an ammonium molybdate solution turns the solution blue. A solution with indigo carmine and sodium carbonate destains when boiled with glucose. In concentrated solutions of glucose with a low proportion of other carbohydrates, its concentration can be determined with a polarimeter. For sugar mixtures, the concentration can be determined with a refractometer, for example in the Oechsle determination in the course of the production of wine. The enzyme glucose oxidase (GOx) converts glucose into gluconic acid and hydrogen peroxide while consuming oxygen. Another enzyme, peroxidase, catalyzes a chromogenic reaction (Trinder reaction) of phenol with 4-aminoantipyrine to a purple dye. The test strip method employs the above-mentioned enzymatic conversion of glucose to gluconic acid to form hydrogen peroxide. The reagents are immobilised on a polymer matrix, the so-called test strip, which assumes a more or less intense color. This can be measured reflectometrically at 510 nm with the aid of an LED-based handheld photometer. This allows for routine blood sugar determination by laymen. In addition to the reaction of phenol with 4-aminoantipyrine, new chromogenic reactions have been developed that allow photometry at higher wavelengths (550 nm, 750 nm). The electroanalysis of glucose is also based on the enzymatic reaction mentioned above. The produced hydrogen peroxide can be amperometrically quantified by anodic oxidation at a potential of 600 mV. The GOx is immobilised on the electrode surface or in a membrane placed close to the electrode. Precious metals such as platinum or gold are used in electrodes, as well as carbon nanotube electrodes, which e.g. are doped with boron. Cu-CuO nanowires are also used as enzyme-free amperometric electrodes. This way a detection limit of 50 µmol/L has been achieved. A particularly promising method is the so-called "enzyme wiring". In this case, the electron flowing during the oxidation is transferred directly from the enzyme via a molecular wire to the electrode. There are a variety of other chemical sensors for measuring glucose. Given the importance of glucose analysis in the life sciences, numerous optical probes have also been developed for saccharides based on the use of boronic acids, which are particularly useful for intracellular sensory applications where other (optical) methods are not or only conditionally usable. In addition to the organic boronic acid derivatives, which often bind highly specifically to the 1,2-diol groups of sugars, there are also other probe concepts classified by functional mechanisms which use selective glucose-binding proteins (e.g. concanavalin A) as a receptor. Furthermore, methods were developed which indirectly detect the glucose concentration via the concentration of metabolised products, e.g. by the consumption of oxygen using fluorescence-optical sensors. Finally, there are enzyme-based concepts that use the intrinsic absorbance or fluorescence of (fluorescence-labeled) enzymes as reporters. Glucose can be quantified by copper iodometry. In particular, for the analysis of complex mixtures containing glucose, e.g. in honey, chromatographic methods such as high performance liquid chromatography and gas chromatography are often used in combination with mass spectrometry. Taking into account the isotope ratios, it is also possible to reliably detect honey adulteration by added sugars with these methods. Derivatisation using silylation reagents is commonly used. Also, the proportions of di- and trisaccharides can be quantified. Glucose uptake in cells of organisms is measured with 2-deoxy-D-glucose or fluorodeoxyglucose. (18F)fluorodeoxyglucose is used as a tracer in positron emission tomography in oncology and neurology, where it is by far the most commonly used diagnostic agent. ^ Domb, Abraham J.; Kost, Joseph; Wiseman, David (1998-02-04). Handbook of Biodegradable Polymers. p. 275. ISBN 978-1-4200-4936-7. ^ Kenji Kamide: Cellulose and Cellulose Derivatives. Elsevier, 2005, ISBN 978-0-080-45444-3, p. 1. ^ "WHO Model List of Essential Medicines" (PDF). World Health Organization. October 2013. Archived (PDF) from the original on 23 April 2014. Retrieved 22 April 2014. ^ "Online Etymology Dictionary". Etymonline.com. Archived from the original on 2016-11-26. Retrieved 2016-11-25. ^ Thénard, Gay-Lussac, Biot, and Dumas (1838) "Rapport sur un mémoire de M. Péligiot, intitulé: Recherches sur la nature et les propriétés chimiques des sucres" Archived 2015-12-06 at the Wayback Machine (Report on a memoir of Mr. Péligiot, titled: Investigations on the nature and chemical properties of sugars), Comptes rendus, 7 : 106–13. From page 109 Archived 2015-12-06 at the Wayback Machine: "Il résulte des comparaisons faites par M. Péligot, que le sucre de raisin, celui d'amidon, celui de diabètes et celui de miel ont parfaitement la même composition et les mêmes propriétés, et constituent un seul corps que nous proposons d'appeler Glucose (1). … (1) γλευχος, moût, vin doux." It follows from the comparisons made by Mr. Péligot, that the sugar from grapes, that from starch, that from diabetes and that from honey have exactly the same composition and the same properties, and constitute a single substance that we propose to call glucose (1) … (1) γλευχος, must, sweet wine. ^ a b Encyclopedia of Food and Health. Academic Press. 2015. p. 239. ISBN 9780123849533. Archived from the original on 2018-02-23. ^ John F. Robyt: Essentials of Carbohydrate Chemistry. Springer Science & Business Media, 2012, ISBN 978-1-461-21622-3. p. 7. ^ Rosanoff, M. A. (1906). "On Fischer's Classification of Stereo-Isomers.1". Journal of the American Chemical Society. 28: 114–121. doi:10.1021/ja01967a014. ^ "Otto Meyerhof - Facts - NobelPrize.org". NobelPrize.org. Retrieved on 5 September 2018. ^ "Hans von Euler-Chelpin - Facts - NobelPrize.org". NobelPrize.org. Retrieved on 5 September 2018. ^ "Arthur Harden - Facts - NobelPrize.org". NobelPrize.org. Retrieved on 5 September 2018. ^ "Bernardo Houssay - Facts - NobelPrize.org". NobelPrize.org. Retrieved on 5 September 2018. ^ "Carl Cori - Facts - NobelPrize.org". NobelPrize.org. Retrieved on 5 September 2018. ^ "Gerty Cori - Facts - NobelPrize.org". NobelPrize.org. Retrieved on 5 September 2018. ^ "Luis Leloir - Facts - NobelPrize.org". NobelPrize.org. Retrieved on 5 September 2018. ^ "glucose." The Columbia Encyclopedia, 6th ed.. 2015. Encyclopedia.com. 17 Nov. 2015 http://www.encyclopedia.com Archived 2009-04-26 at the Wayback Machine. ^ a b Schenck, Fred W. (2006). "Glucose and Glucose-Containing Syrups". Ullmann's Encyclopedia of Industrial Chemistry. doi:10.1002/14356007.a12_457.pub2. ISBN 978-3527306732. ^ Patrick F. Fox: Advanced Dairy Chemistry Volume 3: Lactose, water, salts and vitamins, Springer, 1992. Volume 3, ISBN 9780412630200. p. 316. ^ Benjamin Caballero, Paul Finglas, Fidel Toldrá: Encyclopedia of Food and Health. Academic Press (2016). ISBN 9780123849533, Volume 1, p. 76. ^ McMurry, John E. (1988), Organic Chemistry (2nd ed. ), Brooks/Cole, p. 866, ISBN 0534079687 . ^ a b c d Bunn, H. F.; Higgins, P. J. (1981). "Reaction of monosaccharides with proteins: possible evolutionary significance". Science. 213 (4504): 222–24. Bibcode:1981Sci...213..222B. doi:10.1126/science.12192669. ^ Reginald H. Garrett: Biochemistry. Cengage Learning, 2012, ISBN 978-1-133-10629-6. pp. 194, 199. ^ Donald Voet, Judith G. Voet: Biochemistry, 4th Edition. John Wiley & Sons, 2010, ISBN 978-0470-57095-1. p. 363. ^ Albert L. Lehninger, Biochemistry, 6th printing, Worth Publishers Inc. 1972, ISBN 0-87901-009-6 p. 228. ^ a b c d e U. Satyanarayana: Biochemistry. Elsevier Health Sciences, 2014, ISBN 978-8-131-23713-7. p. 674. ^ Wasserman, D. H. (2009). "Four grams of glucose". American Journal of Physiology. Endocrinology and Metabolism. 296 (1): E11–21. doi:10.1152/ajpendo.90563.2008. PMC 2636990. PMID 18840763. ^ Peter C. Heinrich: Löffler/Petrides Biochemie und Pathobiochemie. Springer-Verlag, 2014, ISBN 978-3-642-17972-3, p. 404. ^ Navale, A. M.; Paranjape, A. N. (2016). "Glucose transporters: Physiological and pathological roles". Biophysical Reviews. 8 (1): 5–9. doi:10.1007/s12551-015-0186-2. PMC 5425736. PMID 28510148. ^ Thorens, B. (2015). "GLUT2, glucose sensing and glucose homeostasis". Diabetologia. 58 (2): 221–32. doi:10.1007/s00125-014-3451-1. PMID 25421524. ^ Huang, S.; Czech, M. P. (2007). "The GLUT4 glucose transporter". Cell Metabolism. 5 (4): 237–52. doi:10.1016/j.cmet.2007.03.006. PMID 17403369. ^ Govers, R. (2014). Cellular regulation of glucose uptake by glucose transporter GLUT4. Advances in Clinical Chemistry. 66. pp. 173–240. doi:10.1016/B978-0-12-801401-1.00006-2. ISBN 9780128014011. PMID 25344989. ^ Ghezzi, C.; Loo DDF; Wright, E. M. (2018). "Physiology of renal glucose handling via SGLT1, SGLT2 and GLUT2". Diabetologia. 61 (10): 2087–2097. doi:10.1007/s00125-018-4656-5. PMC 6133168. PMID 30132032. ^ Poulsen, S. B.; Fenton, R. A.; Rieg, T. (2015). "Sodium-glucose cotransport". Current Opinion in Nephrology and Hypertension. 24 (5): 463–9. doi:10.1097/MNH.0000000000000152. PMC 5364028. PMID 26125647. ^ "Chemistry for Biologists: Photosynthesis". www.rsc.org. Archived from the original on 2016-08-04. Retrieved 2018-02-05. ^ Smith, Alison M.; Zeeman, Samuel C.; Smith, Steven M. (2005). "Starch Degradation". Annu. Rev. Plant Biol. 56: 73–98. doi:10.1146/annurev.arplant.56.032604.144257. PMID 15862090. ^ Donald Voet, Judith G. Voet: Biochemistry, 4th Edition. John Wiley & Sons, 2010, ISBN 978-0470-57095-1. p. 359. ^ a b Donald Voet, Judith G. Voet: Biochemistry, 4th Edition. John Wiley & Sons, 2010, ISBN 978-0470-57095-1. p. 59. ^ a b Leszek Szablewski: Glucose Homeostasis and Insulin Resistance. Bentham Science Publishers, 2011, ISBN 978-1-608-05189-2, p. 46. ^ Adeva-Andany, M. M.; Pérez-Felpete, N.; Fernández-Fernández, C.; Donapetry-García, C.; Pazos-García, C. (2016). "Liver glucose metabolism in humans". Bioscience Reports. 36 (6): e00416. doi:10.1042/BSR20160385. PMC 5293555. PMID 27707936. ^ a b Brian K. Hall: Strickberger's Evolution. Jones & Bartlett Publishers, 2013, ISBN 978-1-449-61484-3, p. 164. ^ Reginald H. Garrett: Biochemistry. Cengage Learning, 2012, ISBN 978-1-133-10629-6, p. 551. ^ Jones, J. G. (2016). "Hepatic glucose and lipid metabolism". Diabetologia. 59 (6): 1098–103. doi:10.1007/s00125-016-3940-5. PMID 27048250. ^ Entner, N. und Doudoroff, M. (1952): Glucose and gluconic acid oxidation of Pseudomonas saccharophila. In: J Biol Chem. Volume 196, issue 2, p. 853–862; PMID 12981024; PDF. ^ Bonadonna, Riccardo C; Bonora, Enzo; Del Prato, Stefano; Saccomani, Maria; Cobelli, Claudio; Natali, Andrea; Frascerra, Silvia; Pecori, Neda; Ferrannini, Eleuterio; Bier, Dennis; DeFronzo, Ralph A; Gulli, Giovanni (July 1996). "Roles of glucose transport and glucose phosphorylation in muscle insulin resistance of NIDDM" (PDF). Diabetes. 45 (7): 915–25. doi:10.2337/diab.45.7.915. PMID 8666143. Retrieved March 5, 2017. ^ Annibaldi, A.; Widmann, C. (2010). "Glucose metabolism in cancer cells". Current Opinion in Clinical Nutrition and Metabolic Care. 13 (4): 466–70. doi:10.1097/MCO.0b013e32833a5577. PMID 20473153. ^ Szablewski, L. (2013). "Expression of glucose transporters in cancers". Biochimica et Biophysica Acta. 1835 (2): 164–9. doi:10.1016/j.bbcan.2012.12.004. PMID 23266512. ^ Adekola, K.; Rosen, S. T.; Shanmugam, M. (2012). "Glucose transporters in cancer metabolism". Current Opinion in Oncology. 24 (6): 650–4. doi:10.1097/CCO.0b013e328356da72. PMID 22913968. ^ Dandekar, T.; Schuster, S.; Snel, B.; Huynen, M.; Bork, P. (1999). "Pathway alignment: Application to the comparative analysis of glycolytic enzymes". The Biochemical Journal. 343 Pt 1: 115–24. doi:10.1042/bj3430115. PMC 1220531. PMID 10493919. ^ "Blood Brain Barrier and Cerebral Metabolism (Section 4, Chapter 11) Neuroscience Online: An Electronic Textbook for the Neurosciences | Department of Neurobiology and Anatomy – The University of Texas Medical School at Houston". Neuroscience.uth.tmc.edu. Archived from the original on 2016-11-17. Retrieved 2016-11-25. ^ a b c Donard Dwyer: Glucose Metabolism in the Brain. Academic Press, 2002, ISBN 978-0-123-66852-3, p. XIII. ^ a b c Koekkoek, L. L.; Mul, J. D.; La Fleur, S. E. (2017). "Glucose-Sensing in the Reward System". Frontiers in Neuroscience. 11: 716. doi:10.3389/fnins.2017.00716. PMC 5742113. PMID 29311793. ^ a b Tucker, R. M.; Tan, S. Y. (2017). "Do non-nutritive sweeteners influence acute glucose homeostasis in humans? A systematic review". Physiology & Behavior. 182: 17–26. doi:10.1016/j.physbeh.2017.09.016. PMID 28939430. ^ La Fleur, S. E.; Fliers, E.; Kalsbeek, A. (2014). Neuroscience of glucose homeostasis. Handbook of Clinical Neurology. 126. pp. 341–51. doi:10.1016/B978-0-444-53480-4.00026-6. ISBN 9780444534804. PMID 25410233. .
^ Bisschop, P. H.; Fliers, E.; Kalsbeek, A. (2015). "Autonomic regulation of hepatic glucose production". Comprehensive Physiology. 5 (1): 147–65. doi:10.1002/cphy.c140009. PMID 25589267. ^ Harold A. Harper: Medizinische Biochemie. Springer-Verlag, 2013, ISBN 978-3-662-22150-1, p. 294. ^ Clarke, S. F; Foster, J. R (2012). "A history of blood glucose meters and their role in self-monitoring of diabetes mellitus". British Journal of Biomedical Science. 69 (2): 83–93. CiteSeerX 10.1.1.468.2196. doi:10.1080/09674845.2012.12002443. PMID 22872934. ^ "Diagnosing Diabetes and Learning About Prediabetes". American Diabetes Association. Archived from the original on 2017-07-28. Retrieved 2018-02-20. ^ a b Richard A. Harvey, Denise R. Ferrier: Biochemistry. 5th Edition, Lippincott Williams & Wilkins, 2011, ISBN 978-1-608-31412-6, p. 366. ^ a b U Satyanarayana: Biochemistry. Elsevier Health Sciences, 2014, ISBN 978-8-131-23713-7, p. 508. ^ Holt, S. H.; Miller, J. C.; Petocz, P. (1997). "An insulin index of foods: The insulin demand generated by 1000-kJ portions of common foods". The American Journal of Clinical Nutrition. 66 (5): 1264–76. doi:10.1093/ajcn/66.5.1264. PMID 9356547. ^ Röder PV, Wu B, Liu Y, Han W (2016). "Pancreatic Regulation of Glucose Homeostasis". Exp. Mol. Med. 48 (3, March): e219–. doi:10.1038/emm.2016.6. PMC 4892884. PMID 26964835. ^ Estela, Carlos (2011) "Blood Glucose Levels," Undergraduate Journal of Mathematical Modeling: One + Two: Vol. 3: Iss. 2, Article 12. ^ Yki-Järvinen, H. (2014). "Non-alcoholic fatty liver disease as a cause and a consequence of metabolic syndrome". The Lancet. Diabetes & Endocrinology. 2 (11): 901–10. doi:10.1016/S2213-8587(14)70032-4. PMID 24731669. ^ "Carbohydrates and Blood Sugar". The Nutrition Source. 2013-08-05. Archived from the original on 2017-01-30. Retrieved 2017-01-30 – via Harvard T.H. Chan School of Public Health. ^ "Food Composition Databases Show Foods List". ndb.nal.usda.gov. ^ a b c d e f g h i P. J. Fellows: Food Processing Technology. Woodhead Publishing, 2016, ISBN 978-0-081-00523-1, p. 197. ^ a b Thomas Becker, Dietmar Breithaupt, Horst Werner Doelle, Armin Fiechter, Günther Schlegel, Sakayu Shimizu, Hideaki Yamada: Biotechnology, in: Ullmann's Encyclopedia of Industrial Chemistry, 7th Edition, Wiley-VCH, 2011. ISBN 978-3-527-32943-4. Volume 6, p. 48. ^ a b c The Amylase Research Society of Japan: Handbook of Amylases and Related Enzymes. Elsevier, 2014, ISBN 978-1-483-29939-6, p. 195. ^ Madsen, G. B.; Norman, B. E.; Slott, S. (1973). "A New, Heat Stable Bacterial Amylase and its Use in High Temperature Liquefaction". Starch - Stärke. 25 (9): 304–308. doi:10.1002/star.19730250906. ^ Norman, B. E. (1982). "A Novel Debranching Enzyme for Application in the Glucose Syrup Industry". Starch - Stärke. 34 (10): 340–346. doi:10.1002/star.19820341005. ^ James N. BeMiller, Roy L. Whistler (2009). Starch: Chemistry and Technology. Food Science and Technology (3rd ed.). New York: Academic Press. ISBN 978-0080926551. ^ Alan Davidson: Oxford Companion to Food (1999). "Mizuame", p. 510 ISBN 0-19-211579-0. ^ Alan Davidson: The Oxford Companion to Food. OUP Oxford, 2014, ISBN 978-0-191-04072-6, p. 527. ^ Oregon State University: Sugar, accessed 28 June 2018. ^ "High Fructose Corn Syrup: Questions and Answers". US Food and Drug Administration. 2014-11-05. Archived from the original on 2018-01-25. Retrieved 2017-12-18. ^ Kevin Pang: Mexican Coke a hit in U.S. In: Seattle Times, October 29, 2004. ^ Steve T. Beckett: Beckett's Industrial Chocolate Manufacture and Use. John Wiley & Sons, 2017, ISBN 978-1-118-78014-5, p. 82. ^ James A. Kent: Riegel's Handbook of Industrial Chemistry. Springer Science & Business Media, 2013, ISBN 978-1-475-76431-4, p. 938. ^ Barfoed, C. (1873). "Ueber die Nachweisung des Traubenzuckers neben Dextrin und verwandten Körpern". Zeitschrift für Analytische Chemie. 12: 27–32. doi:10.1007/BF01462957. ^ Trinder, P. (1969). "Determination of Glucose in Blood Using Glucose Oxidase with an Alternative Oxygen Acceptor". Annals of Clinical Biochemistry: An International Journal of Biochemistry and Laboratory Medicine. 6: 24–27. doi:10.1177/000456326900600108. ^ Mizoguchi, Makoto; Ishiyama, Munetaka; Shiga, Masanobu (1998). "Water-soluble chromogenic reagent for colorimetric detection of hydrogen peroxide—an alternative to 4-aminoantipyrine working at a long wavelength". Analytical Communications. 35 (2): 71–74. doi:10.1039/A709038B. ^ Wang, J. (2008). "Electrochemical glucose biosensors". Chemical Reviews. 108 (2): 814–25. doi:10.1021/cr068123a. PMID 18154363. .
^ Chen, X.; Chen, J.; Deng, C.; Xiao, C.; Yang, Y.; Nie, Z.; Yao, S. (2008). "Amperometric glucose biosensor based on boron-doped carbon nanotubes modified electrode". Talanta. 76 (4): 763–7. doi:10.1016/j.talanta.2008.04.023. PMID 18656655. ^ Wang, Guangfeng; Wei, Yan; Zhang, Wei; Zhang, Xiaojun; Fang, Bin; Wang, Lun (2010). "Enzyme-free amperometric sensing of glucose using Cu-CuO nanowire composites". Microchimica Acta. 168 (1–2): 87–92. doi:10.1007/s00604-009-0260-1. ^ Ohara, T. J.; Rajagopalan, R.; Heller, A. (1994). ""Wired" enzyme electrodes for amperometric determination of glucose or lactate in the presence of interfering substances". Analytical Chemistry. 66 (15): 2451–7. doi:10.1021/ac00087a008. PMID 8092486. ^ a b Borisov, S. M.; Wolfbeis, O. S. (2008). "Optical biosensors". Chemical Reviews. 108 (2): 423–61. doi:10.1021/cr068105t. PMID 18229952. ^ Ferri, S.; Kojima, K.; Sode, K. (2011). "Review of glucose oxidases and glucose dehydrogenases: A bird's eye view of glucose sensing enzymes". Journal of Diabetes Science and Technology. 5 (5): 1068–76. doi:10.1177/193229681100500507. PMC 3208862. PMID 22027299. ^ Mader, Heike S.; Wolfbeis, Otto S. (2008). "Boronic acid based probes for microdetermination of saccharides and glycosylated biomolecules". Microchimica Acta. 162 (1–2): 1–34. doi:10.1007/s00604-008-0947-8. ^ Wolfbeis, Otto S.; Oehme, Ines; Papkovskaya, Natalya; Klimant, Ingo (2000). "Sol–gel based glucose biosensors employing optical oxygen transducers, and a method for compensating for variable oxygen background". Biosensors and Bioelectronics. 15 (1–2): 69–76. doi:10.1016/S0956-5663(99)00073-1. ^ a b Galant, A. L.; Kaufman, R. C.; Wilson, J. D. (2015). "Glucose: Detection and analysis". Food Chemistry. 188: 149–60. 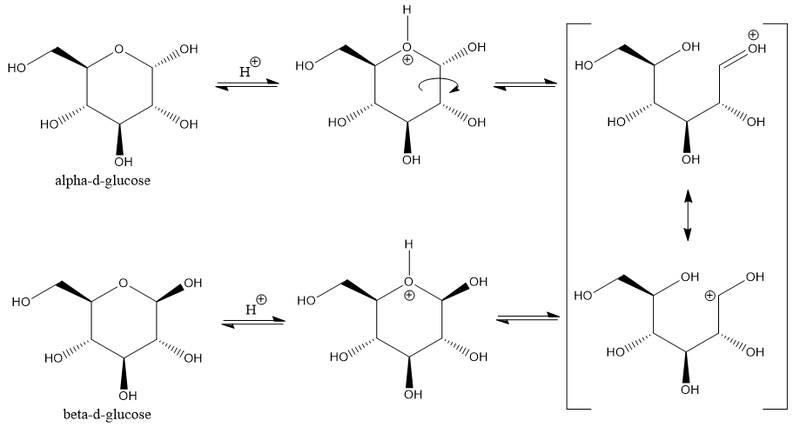 doi:10.1016/j.foodchem.2015.04.071. PMID 26041177. ^ M. L. Sanz, J. Sanz, I. Martínez-Castro: Gas chromatographic-mass spectrometric method for the qualitative and quantitative determination of disaccharides and trisaccharides in honey. In: Journal of Chromatography A, volume 1059, issue 1–2, 2004, p. 143–148; PMID 15628134. ^ Max Planck Institute of Molecular Plant Physiology in Golm Database (2007-07-19). "Glucose mass spectrum". 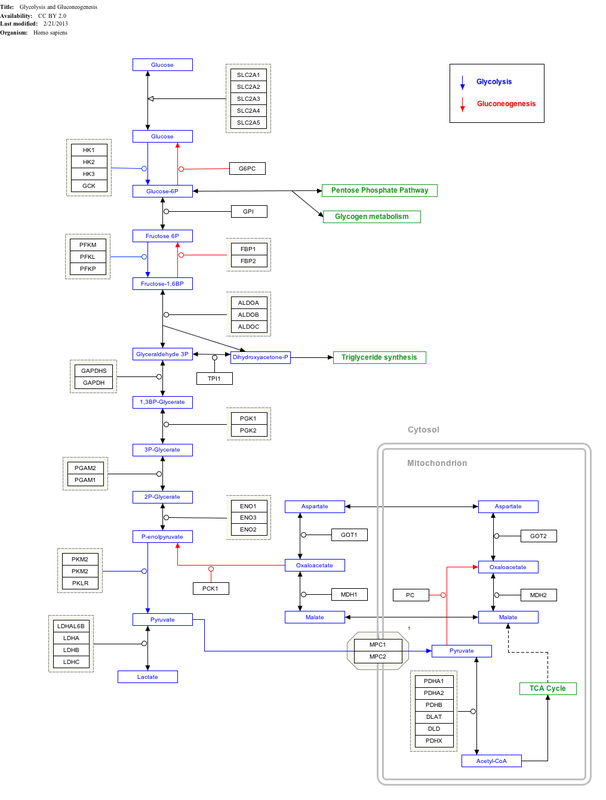 Golm Metabolome Database. Retrieved 2018-06-04. ^ A. I. Cabañero, J. L. Recio, M. Rupérez: Liquid chromatography coupled to isotope ratio mass spectrometry: a new perspective on honey adulteration detection. In: J Agric Food Chem. 54(26), 27 December 2006, p. 9719–9727; PMID 17177492. ^ Becker, M.; Liebner, F.; Rosenau, T.; Potthast, A. (2013). "Ethoximation-silylation approach for mono- and disaccharide analysis and characterization of their identification parameters by GC/MS". Talanta. 115: 642–51. doi:10.1016/j.talanta.2013.05.052. PMID 24054643. ^ Gesellschaft Deutscher Chemiker: wayback=20100331071121 Anlagen zum Positionspapier der Fachgruppe Nuklearchemie, February 2000. ^ Maschauer, S.; Prante, O. (2014). "Sweetening pharmaceutical radiochemistry by (18)f-fluoroglycosylation: A short review". BioMed Research International. 2014: 1–16. doi:10.1155/2014/214748. PMC 4058687. PMID 24991541. 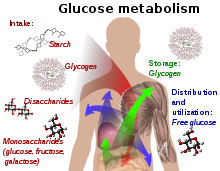 Wikimedia Commons has media related to Glucose.